More than 30 years ago, Las Vegas Air Conditioning began as a one-man operation with a single van. Thanks to a reputation of being the best in the market and always doing the right thing for customers, the company grew. When Las Vegas Air Conditioning approached us in 2014, though, the existing brand felt dated and did not properly reflect the company, according to co-owner Stephen Gamst. The HVAC firm was expanding quickly and looking to increase its advertising and marketing presence, but wanted to do so with a powerful logo and brand that would properly convey trust, intelligence and speed. Las Vegas Air Conditioning needed a brand that blended the old-fashioned values of trust and reliability with the modern HVAC industry’s technology and speed. To do this, we paired a modern font with a present-day approach to a common branding element used in ‘50s logos – a mascot. Since I rebranded, I have seen revenues triple, and I get every job I bid on because the entire business is so trustworthy and reputable in the customer’s eye. Using an unconventional color palette of orange and blue, the font in the logo is italicized to convey speed, and bold lettering with sharp angles delivers a high-tech, contemporary feel. Meanwhile, the friendly mascot uses the same complementary color palette, and offers an honest “can-do” attitude with a thumbs-up, wink and smile. Combining these opposing characteristics into a cohesive brand was only possible with the expertise of our graphic design team. 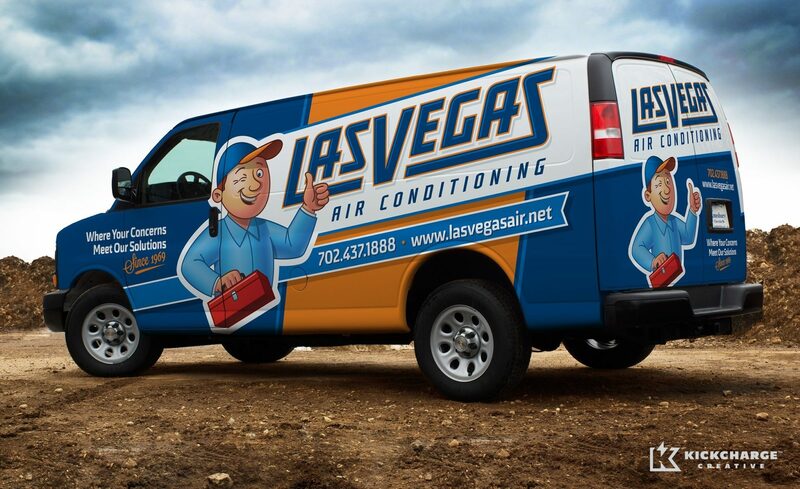 Along with stationery design, we created a rolling billboard for Las Vegas Air Conditioning via a custom-designed vehicle wrap. The design prominently features the new logo and its slogan: “Where Your Concerns Meet Our Solutions Since 1969.” The truck wrap design reinforces the innovative-yet-established theme through modern and vintage flourishes on the fonts. Building a trustworthy brand image for Las Vegas Air Conditioning was no sweat, because the company had a 30-plus-year reputation of quality work. The company now competes with much larger firms in its market, and revenue has jumped. 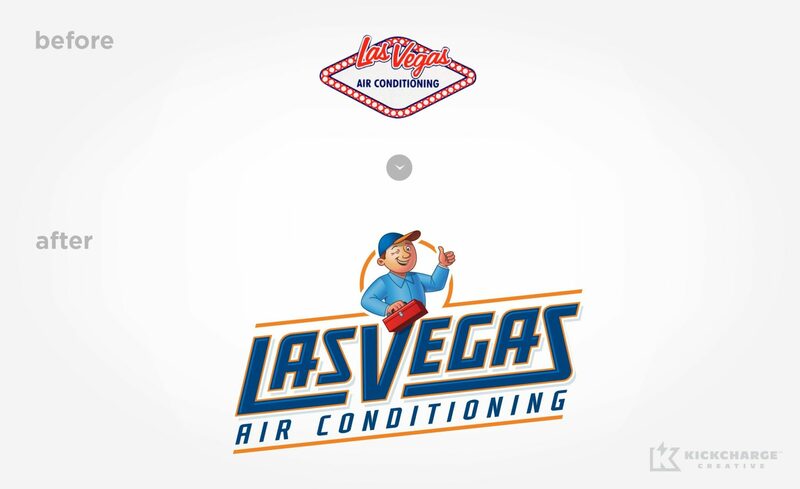 And with the updated brand image, Las Vegas Air Conditioning has seen an increased close rate.